1. "Sounds Like an Idea That's 20 Years Old"
Editor's note: Some videos in this interview are taken from the Japanese version of the game. The final version is fully localised in English. 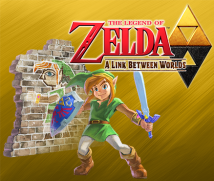 The Legend of Zelda: A Link Between Worlds is finally finished. From what I’ve heard, development was quite a challenge. 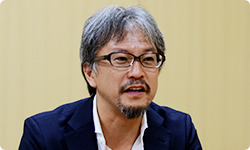 First, let’s have everyone introduce what they were in charge of, starting with Aonuma-san. As usual, I was producer. The Legend of Zelda: A Link to the Past1 was the game that got me involved with the series. We’re making a sequel 22 years later, and as producer, I was in the position of waiting around excitedly to see what it would be like.1. The Legend of Zelda: A Link to the Past: An action-adventure game released for the Super NES system in September 1992. I’m Shikata. I was director for the first time on this game. I’ve been involved with The Legend of Zelda series since The Legend of Zelda: Ocarina of Time2 15 years ago.2. The Legend of Zelda: Ocarina of Time: An action-adventure game released for the Nintendo 64 system in December 1998. You’ve worked on The Legend of Zelda for 15 years? For not the entire 15 years, but I was involved in most Zelda games. 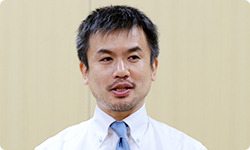 I’m Mouri, assistant director and program leader. This was my fourth game in the Zelda series. First, I was involved with The Legend of Zelda: Four Swords Adventures3, and then I was main programmer for The Legend of Zelda: Phantom Hourglass4 and The Legend of Zelda: Spirit Tracks.53. The Legend of Zelda: Four Swords Adventures: An action-adventure game released for the Nintendo GameCube console in January 2005.4. The Legend of Zelda: Phantom Hourglass: A stylus controlled action-adventure game released for the Nintendo DS system in October 2007.5. The Legend of Zelda: Spirit Tracks: A stylus controlled action-adventure game released for the Nintendo DS system in December 2009. 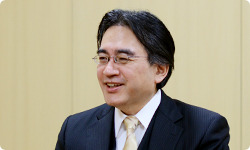 You were main programmer on the Zelda handheld games that came out in the last few years. That’s right, I did that while getting co-operation of all sorts of staff members. I’m Tominaga. As assistant director and plan leader, I performed tasks like co-ordinating the planners. In the Zelda series, I worked on The Legend of Zelda: The Wind Waker6 my first year at the company, and after that, I was a planner for The Legend of Zelda: Twilight Princess7 and The Legend of Zelda: Skyward Sword.8 And I helped with debugging of The Legend of Zelda: Four Swords Adventures, so ever since I joined the company, I’ve been involved with The Legend of Zelda for home consoles. This was my first time for a handheld.6. The Legend of Zelda: The Wind Waker: An action-adventure game released for the Nintendo GameCube console in May 2003.7. The Legend of Zelda: Twilight Princess: An action-adventure game released for the Wii and Nintendo GameCube consoles in December 2006.8. The Legend of Zelda: Skyward Sword: An action-adventure game released for the Wii console in November 2011. I’m Takahashi. As design leader, I co-ordinated the design. 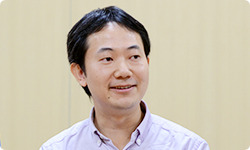 You were also design leader for Animal Crossing: New Leaf9. When that was over, you jumped right into The Legend of Zelda?9. Animal Crossing: New Leaf: A communication game released for the Nintendo 3DS system in June 2013. Yes. As soon as it was over. In The Legend of Zelda series, I was also a designer for Phantom Hourglass and Spirit Tracks. When did the idea come up of making a new Zelda game for Nintendo 3DS? Well, as director, Shikata-san should talk about that. Sure. It first came up right after we finished Spirit Tracks. Oh, it was right after Spirit Tracks was finished? It took quite a long time then. It’s already been four years. When The Legend of Zelda: Spirit Tracks was over, much of the staff went to develop Sword. We had to begin working on Skyward Sword immediately. 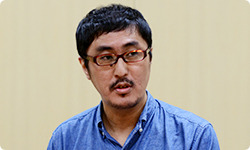 The only ones left were Mouri-san, another programmer and I. Nintendo 3DS wasn’t out yet, but our goals was to make a Zelda game for the handheld that would follow Nintendo DS, so for about the first year, we thought a lot about what to do. Just the three of you for a whole year? Wasn’t that hard? Yeah. We anguished over it every day, wondering what we should do. the system of Link becoming a mural art . It took quite some time to reach that point. Yeah. At first, just the three of us were steeped in it, looking around in all directions. After about half a year, just to get the project through, we decided to give a presentation to Miyamoto-san and have him say yay or nay. Did you have the idea then of making a sequel to A Link to the Past? From 20 years ago? (laughs) Did the air get chilly? 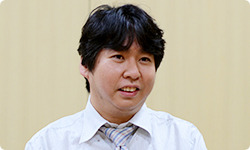 As soon as we started the presentation, I could clearly see Miyamoto-san’s facial expression rapidly darkening. I thought, “This is bad…” And then at the end he said, “This sounds like an idea that’s 20 years old,” that was the final blow. We were down on the floor. What did you do once you were beaten down? He had ripped it apart so badly that I was distraught. We decided to rethink it from the start, and one day when the three of us were having a meeting, I suddenly said, “What about having Link enter into walls?” Mouri-san and the other programmer were like, “That’s great!” and got into it. But even though I had brought it up, it didn’t quite make sense to me. You weren’t certain it would be fun, but you blurted it out anyway? Right. So I asked them what was so good about it.